Teasel, originally uploaded by The Bacher Family. 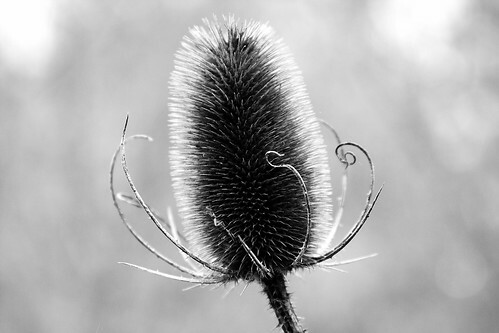 Teasel is a noxious weed... but like so many weeds, it's beautiful in its own way, with a striking profile full of delicate (and painful to the touch) barbs and spines. It looks like something designed by Tim Burton in his Edward Scissorhands phase, and it's perfect for a black and white silhouette. I like the bokeh behind this image. The color version is nice too. I photographed this while geocaching with my father in Corvallis, Oregon.